Dekendieren are created from polyester animal forms, upholstered by hand with wool blankets. The animals are intended as a decoration in your living or working environment. It’s certainly not a toy! Dekendieren are made by hand. With great attention to detail. Proportions, materials and finishes, everything has to be right. We work with the highest quality-polyester models out there. Then we choose the most appropriate woolen blanket per animal. We pay close attention to color, pattern and form. Each piece is tailor-made, the wool forming a second skin on the model, we make sure the seams are out of sight. You would almost think they were born this way. Can I order my Dekendier in a different color? That is definitely possible! We have an incredible stock of blankets that you can choose from. Please contact us via the contact form so we can make an appointment with you. Is it possible to supply my own blanket? 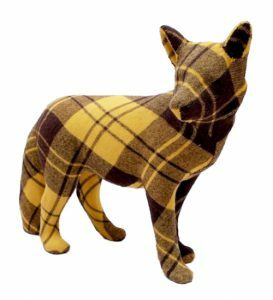 We work with checkered woolen blankets, but we are up to a challenge, it just depends. If it is a very special request, we will see if we can make an exception. Please contact us via the contact form to discuss the possibilities. Can I order several animals in the same color? Yes, that’s possible. However, please note that it might take more production time. Contact us via the contact form and let’s discuss the possibilities. I have a very particular animal I would like to have made, can you do this? Creating is what we love best, so in principle the answer is yes. But we should of course discuss what it is you are dreaming of and if we can create it. Please feel free to contact us! Can you also work on location? We have a lovely studio in Den Bosch where we have plenty of space to work, but if needed, we can also work on location. Please contact us via the contact form to discuss the possibilities. We take care of our animals: Dekendieren are all safely shipped in wooden crates. These can be used as a base for your beloved new family member or as extra furniture in your home. We ship worldwide. Animals that go abroad are also safely shipped in a wooden crate. This can be used as a base or as extra furniture in your home.